No island trip would be complete without a little seafood. Clam chowder in a bread bowl is always a good choice since Catalina restaurants pride themselves on their chowder. While exploring the Green Pleasure Pier, you will notice a building on the end titled “Fish & Chips”. Your chowder will be $8.50 and the view from your seat on the pier is worth every penny. How does one turn down $1 tacos? With an ever-changing menu of carne asada, chicken, chorizo and ground beef to name a few, there are a variety of tacos to choose from that will make your taste buds want to dance. The $1 taco special starts at 2 pm - 5 pm, which is perfect for after your morning hike. The tacos are made in front of you, adding a show to your late lunch. The Sandtrap is near the Catalina Island Golf Course and known as the unofficial “19th Hole” for the golfers. Before you are off to conquer the afternoon, you need a lunch that will not leave you hungry. You’ll be sure to find something you’ll like since you are creating it. Ben’s Bakery offers a build your own sandwich or wrap option for $8. You can take it to go so you can start your Trans-Catalina Trail hike. Coney Island West is a local favorite for their wonderful food at affordable prices. While known for their hamburgers and hot dogs, the charbroiled chicken sandwich for $7.75 is a great choice. The chicken is tender, juicy and leaves you enjoying every bite. When people think of island getaway, pizza is not always the first food they think of for lunch. They would be missing out. 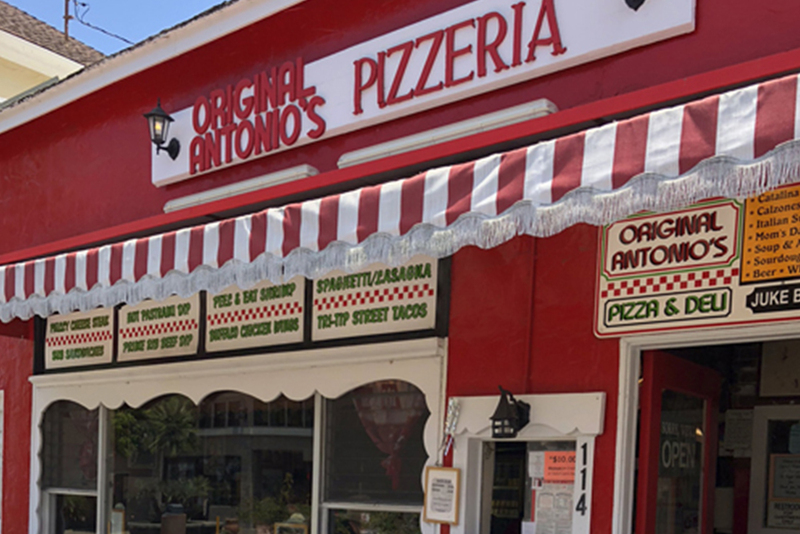 The Original Antonio’s has been a staple for locals and visitors for over 37 years and will take you back to the days of the 1950’s. A piece of cheese pizza runs for $3.30 and is the perfect selection for the visitor on the go. Enjoy your slice of gooey goodness as you stroll along the beach. Just don’t be surprised when others ask where you got it from. Many might not think of an arcade as a lunch spot, but Three Palms will make you change your mind. Three Palms serves salads and wraps with your choice of curly fries or Cajun sweet potato fries for only $8.95 each, leaving you money to play a couple rounds of skeeball after. Pairing the sweet and tangy Asian chicken wrap with the spice from the Cajun sweet potato fries, it is the perfect match. This coffee shop in the Metropole Market is a favorite of many thanks to their delicious coffee and baked goods. It is also a great spot for a quick lunch with their Ham and Cheese Croissant for $5.25. The warm and flaky croissant elevates the standard to ham and cheese sandwich to another level. After a delightful lunch, your sweet tooth is going to be craving a special treat later. You are on vacation, so indulge with a scoop of ice cream at Lloyd’s of Avalon. These are just a couple of Avalon great lunch deals. Check out the Catalina Island Chamber and Visitors Bureau site for a full list of yummy restaurants to savor on your next trip.